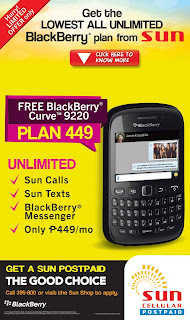 Get Blackberry Curve 9220 for free on Sun Plan 499, offers all unlimited for only P499 monthly charge. You can enjoy unlimited Sun texts, unlimited Sun calls and unlimited Blackberry Messenger (BBM) on your free Blackberry Curve 9220 when you avail this on Sun postpaid plan. You can never miss your friend’s social updates from Facebook and Twitter as they are also linked on your Blackberry Messenger. Globe Telecom also offers Blackberry Curve 9220 at Plan 299 that comes with P299 monthly consumable and a changeable monthly freebie. You may continue reading below more about Blackberry Curve 9220 Sun Plan 499. If you want to compare Blackberry Curve 9220 Sun Plan 499 to Blackberry Curve 9220 Globe Plan 299, Globe offers offers no unlimited BBM and freebies option also doesn’t offer unlimited calls and texts but has a P299 monthly consumable. To enjoy BBM on Blackberry Curve 9220 Globe Plan 299 you have to avail the additional options which cost P99 BB Chat for unlimited BBM or P299 BB Social (unlimited Facebook, Twitter, BBM and IM). 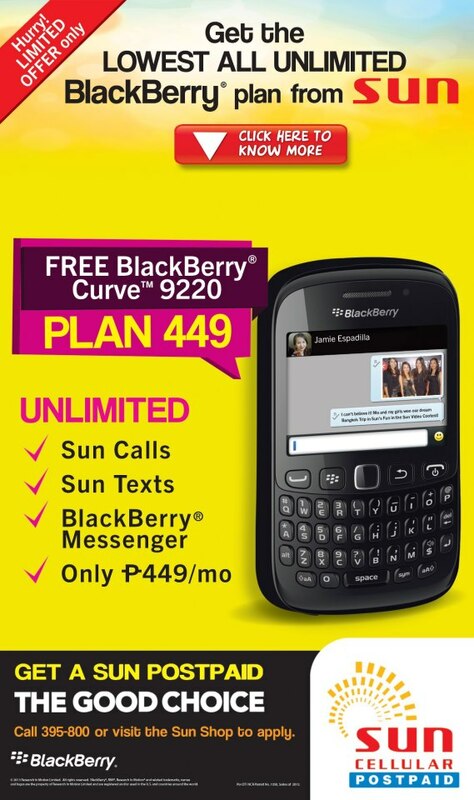 To apply Blackberry Curve 9220 Sun Plan 499, you can call 395-800 or visit your nearest Sun Shop to inquire before availing this postpaid plan. For list requirements on applying Sun Postpaid plan you may see Just comply to their terms and conditions and complete the applications requirements indicated here. For more information, visit Sun Blackberry Facebook page www.facebook.com/SunBlackBerry and follow @suncelldeals on Twitter.